With increasing population and affluence, the need for waste management has also increased. Waste Management (WM) is the largest provider of comprehensive waste management services in North America. The company is based in Houston, Texas and is involved in the collection and disposal of waste. It also operates a number of waste-to-energy facilities and owns a network of recycling facilities, transfer stations and landfills in the industry. It provides recycling, resource recovery and other services to more than 20 million residential, commercial, industrial and municipal customers in the US and Canada. Given the company’s leadership position in the waste industry and cheap valuation, I think the stock is a good long term buy. Waste management industry can be trifurcated into three segments. Waste collection is the largest segment accounting for 61% of industry’s revenues in 2012, second is transporting and processing waste and third is waste disposal and waste-to-energy. Waste Management focuses mainly on the first and second segment. 1) Largest Recycler in North America – Waste Management is the largest recycler in North America and plans to recycle 20 million tons every year by 2020. The company also intends to invest in future technologies to achieve this target. It serves more than 20 million customers in the U.S. and Canada. 2) High yield stock and share repurchases – Waste Management paid a dividend of $0.385 per share in March 2015. The company returned ~$172 million during the fourth quarter of 2014 and $1.29 billion for the full year, to the shareholders as dividends. The current yield is nearly 3%. The company intends to do a share repurchase program in the second half of 2015, to distribute the proceeds from the sale of Wheelabrator in July 2014. 3) Focusing on its Core Business – Waste Management wanted to increase focus on its core business of waste collection and disposal. It therefore sold off Wheelabrator to Energy capital Partners in July 2014, for $1.94 billion in cash. Waste Management wanted to concentrate on its core business by reducing earnings volatility related to electricity sales. The company announced its acquisition of Deffenbaugh Disposal Inc. in March 2015. This acquisition strengthens the company’s focus on its core business. Deffenbaugh owns five collection operations, seven transfer stations, two recycling facilities and two landfills. 4) Biggest producer of renewable energy – According to the company’s website, it produced more than twice the amount of renewable electricity than the entire US solar industry. The company extracts natural gases from landfills and converts them into electricity (landfill-gas-to-energy). Waste Management produced energy enough to power nearly 500,000 homes. Waste Management also uses natural gas as fuel for its truck fleet. The company had set a goal to reduce its fleet emissions by 15% till 2020, but achieved this target in 2011 itself. 5) Decent Performance – The company has shown steady improvement in the last five years, with net income increasing by 36%. The stock also returned close to 57.6% in the last five years. The company’s share prices have been rising, returning more than 26% in the last one year. 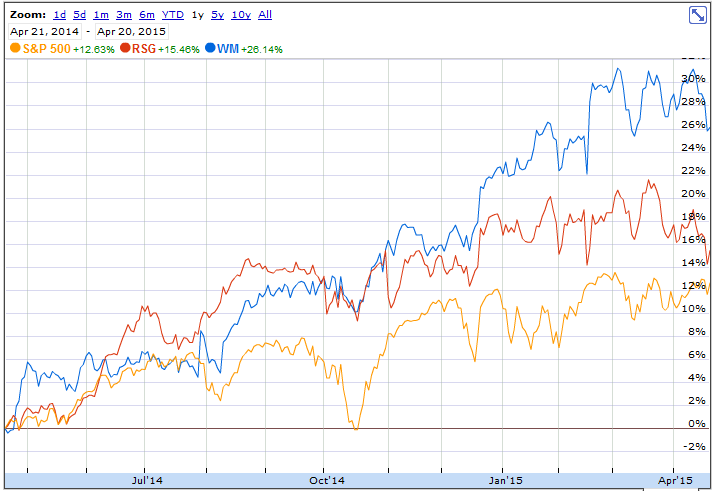 It outperformed the broader S&P, which yielded close to 12% during the same time. Waste Management also outperformed its biggest competitor Republic Services (RSG)..
Stagnant Revenues – The main concern for Waste Management is that its revenues are not growing. Though revenues have increased in the last five years, the rate of growth has been low. This is a typical characteristic of a utility stock. The volatility is low but the growth is also not that high, which means that WM has almost a zero chance of being a big multi-bagger. The company has a market capitalization of $24.3 billion and currently trades at ~$53 which is near to its 52-week high. The stock looks cheap with a P/E of 19.5x, compared to the industry average of ~34x. Its P/S is 1.8x, which is close to industry average of 1.7x. Waste Management is the leader in managing waste in the American market. The company has a history of strong dividend pay-outs and is starting a share repurchase program as well. Its stock performance was better than its main competitor Republic Services and it even outperformed the broader market. I believe Waste Management is a good stock to own for the long term for steady price appreciation with low volatility.